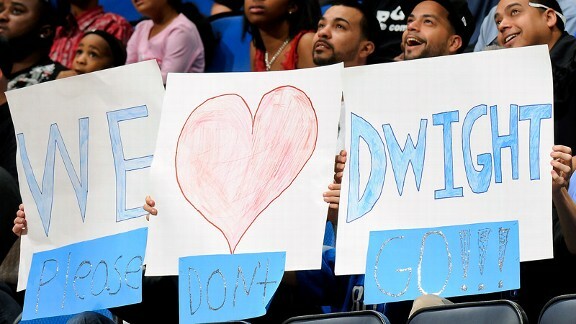 Fernando Medina/NBAE/Getty Images Magic fans can have a (temporary) celebration after Dwight Howard's decision. Hey, Cleveland -- take notes. That's what Magic superfan and creator of the "Stay Dwight" campaign Ryan Totka is telling Cavaliers fans after Dwight Howard committed to stay in Orlando for at least one more year on Thursday. Eleven months, hundreds of hours of work and more than $20,000 later, Totka, the originator of StayDwight.com, finally received some good news on Thursday when Dwight Howard waived his early termination option. It's what Cleveland wanted from LeBron James in 2010 and, of course, never received. "In Cleveland it all got swept up at the last minute," Totka said of the fans' campaign to keep James. "I wanted us to have some time to prepare for it, and this is a statement that Orlando has the best fans because basketball is all we have." Totka started the grassroots campaign, which included billboards, t-shirts, stickers, banners and business sponsorships, last April right before the playoffs. A celebrity booking agent, he spent his own money on the materials and processing costs of the movement. He attended games wearing his t-shirts and held up signs, and eventually the effort caught on as the "Stay Dwight" logo went up on business fronts all over the city. Howard mostly ignored the signs and billboards, the same way he avoided questions from media members about his future. And all season long it appeared the efforts would be for naught, as Howard seemed uninterested in playing for the Magic. "You hear him say there's no place I'd rather be than Orlando, and then he says these are the other teams he wants to play for," Totka said. "That's what made you wonder where his heart is." Well, after Thursday, Howard's heart is in Orlando -- at least for one more year. And Totka can take solace in the fact that his campaign played at least a back-of-mind role in Howard's decision. He's hosting a "Stay Dwight" party on Friday night in downtown Orlando, and he's expecting hundreds of Magic fans to attend. And then they can wake up and start it all over again. The summer of 2013 is right around the corner.